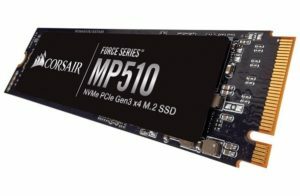 CORSAIR®, a world leader in PC gaming peripherals and enthusiast components, today announced the CORSAIR Force Series MP510 M.2 PCIe NVMe SSD, the latest and fastest in its range of M.2 solid state drives. 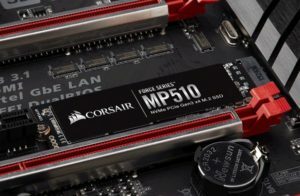 The MP510 delivers blazing fast sequential read speeds up to 3,480MB/sec, and sequential write speeds up to 3,000MB/s, making it CORSAIR’s highest performing SSD yet. Behind this incredible performance is the MP510’s high-density 3D TLC NAND flash memory and effective thermal management that channels heat away from the PCB, ensuring the ideal mix of performance, reliability, and endurance to keep the drive operating optimally for years. 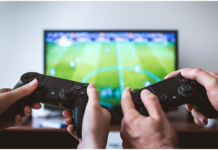 The MP510, along with the entire range of MP500 SSDs, is also compatible with CORSAIR SSD Toolbox software, enabling advanced drive controls such as secure erase and firmware updates directly from your desktop.